POMPANO BEACH, Fla. - A south Florida man is in jail on a second-degree murder charge after police say he stabbed his roommate more than 25 times during an argument. 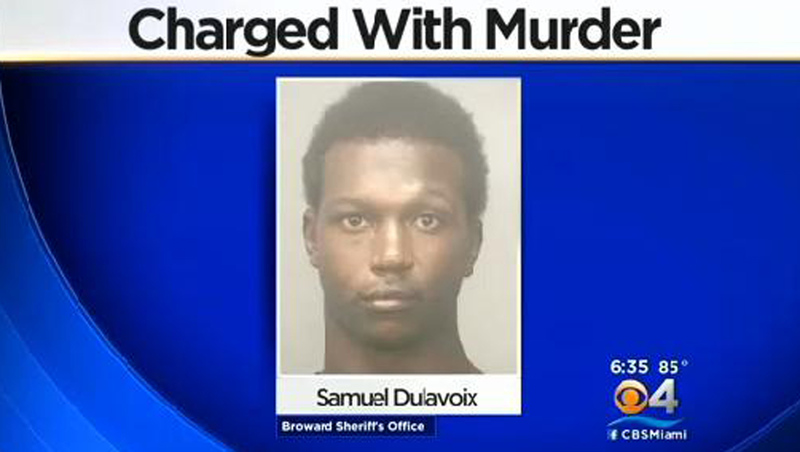 Broward County Sheriff officials say they responded to a disturbance Saturday night and were greeted at a Pompano Beach apartment by 22-year-old Samuel Dulavoix, who was covered in blood. Through an open door, officials said sheriff deputies could see a pile of blankets on top of a shape consistent with a human body. Dulavoix told investigators that he and 39-year-old roommate Rahmil Alexander were arguing over money and that during the confrontation he stabbed him. Dulavoix said he and Alexander had been living together for about a year. The Broward County Medical Examiner ruled the case a homicide at the scene and said Alexander died of multiple stab wounds. Authorities say Dulavoix made attempts to clean up the scene and conceal the body. Dulavoix was taken to Broward Health Imperial Point for treatment on superficial cut wounds to his hands, according to CBS Miami. The suspect is charged with second-degree murder. The Sun-Sentinel reports he is being held without bond.